This guide is all about AssistiveTouch basics you should know, including AssistiveTouch features, how to use AssistiveTouch and more. PhoneRescue – A Smart Way to Recover Deleted Photos on iOS Devices. Simply download PhoneRescue and try it to recover your mistakenly deleted photos from your iPhone before reading this guide. AssistiveTouch is a convenient feature that lets iOS users access buttons and trigger features that require movement without having to push buttons or lift the iPhone iPad. It helps you use iPhone if you have difficulty touching the screen or pressing the buttons. You can also use AssistiveTouch to control your iPhone iPad, help you perform gestures like a pinch, multi-finger swipe, or 3D Touch, and use Siri. 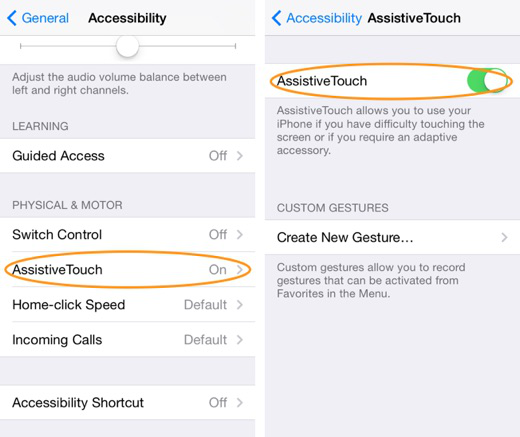 If you want to know how to turn on AssistiveTouch on your iPhone iPad, have a try the following ways to make it easily. Method 1. Go to Settings > General > Accessibility > AssistiveTouch, then turn on AssistiveTouch. Method 1. Tell Siri "Turn on AssistiveTouch." Method 3. Go to Settings > General > Accessibility > Accessibility Shortcut and turn on AssistiveTouch. When Accessibility Shortcut is on, you can turn AssistiveTouch on or off from any screen using Triple-click Home. Just press the Home button three times. To adjust the Triple-click speed, go to Settings > General > Accessibility > Home-click Speed. Show or hide the menu. Tap the floating menu button, or click the secondary button on the accessory of iPhone. Simulate pressing the Home button. Tap the menu button, and then tap Home button. 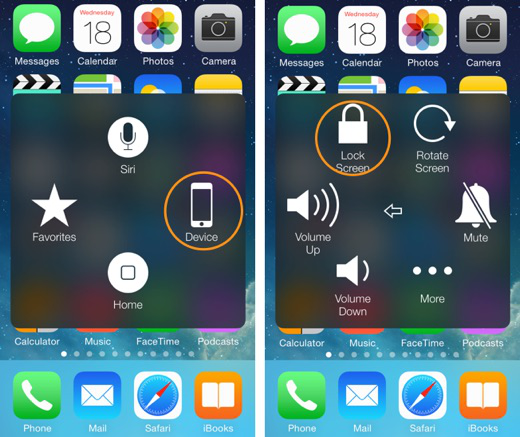 Lock or rotate the screen, adjust iPhone volume, or simulate shaking iPhone. Tap the menu button, then tap Device. Perform a swipe or drag that uses 2, 3, 4, or 5 fingers. Tap the menu button, tap Device > More > Gestures, then tap the number of digits needed for the gesture. When the corresponding circles appear on the screen, swipe or drag in the direction required by the gesture. When you finish, tap the menu button on your device. Perform a pinch gesture. Tap the menu button > tap Favorites > Tap Pinch. When the pinch circles appear, touch anywhere on the screen to move the pinch circles, then drag the pinch circles in or out to perform a pinch gesture. When you finish, tap the menu button. Create your own gesture. You can add your own favorite gestures to the control menu (for example, tap and hold or two-finger rotation). Tap the menu button > Favorites > Tap an empty gesture placeholder. Or go to Settings > General > Accessibility > AssistiveTouch > Create New Gesture. If you have an iPhone 6s or iPhone 6s Plus, you can use 3D Touch with AssistiveTouch. 3D Touch gives you shortcuts to things you do frequently—like send Messages (Learn: how to transfer messages from iPhone to Mac), emails, and photos (Lean: how to import photos from iPhone to PC). To find 3D Touch, open the AssistiveTouch menu and tap Custom. To choose a 3D Touch gesture: Go to Settings > General > Accessibility > AssistiveTouch > Customize Top Level Menu > 3D Touch Action.